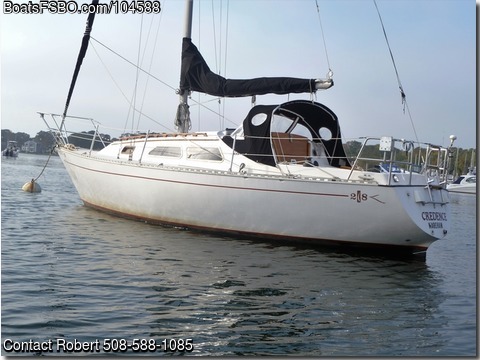 Boat is located in Wareham,MA.Please contact the owner @ 508-588-one zero eight five...1982, 28 ft.
Islander Bahama, a Robert Perry design. Yanmar 2GM diesel ,jib on Shafer rolling furling system multi color drifter ( code ) for light air work. all sails in very good condition. Dodger, cockpit sun awning, Garmin GPS system AC/DC rifer. unite shore power, Raytheon auto helm. Many upgrades and additional equipment. Boat is set-up for cruising. 9ft fiberglass dingy with 2.5 hp Johnsen outboard included .All systems operational /in good order. All Spring commissioning completed, boat has been launched ready to sail away. I have sailed this boat for 17+ years it is an outstanding performer with much life to give the next owner.